For about a month now, a new bus from Alcala de Henares to Madrid Airport can take you directly to the Terminals T1 and T2 ( T3 is in a walking distance from it, for T4 you will need to take the airport bus connecting the terminals). Some of the buses start from Alcala’s hospital on the university campus and some others begin in Avenida Complutense close to Carrefour, and to the main bus station. However, there are several bus stops in the town, so you should check the route, to find out whether there is a stop close to your home. The buses usually run on a 30 min schedule, and it takes approximately 50 minutes from the Hospital to reach the airport. A one-way ticket costs 3,60€. 35 Responses to New bus from Alcala de Henares to Madrid Airport!!! Hola! is it possible to take the bus from the airport to the Parador in Alcala? if so what is the stop? thanks! There isn’t a bus stop close to Parador de Alcalá. The best option for you, if you don’t have much baggage, is to get off the bus at Vía Complutense and walk to Parador from there (it shouldn’t take you more than 5-10 minutes). Many thanks for bus info! Hola! De donde se pueden comprar billetes para el bus? Hay billetes de ida y vuelta? Y, si los hay, cuanto cuestan? Ademas, se puede volver cualquier dia o hay que saber desde el principio cuando? what is the nearest stop from paradore to take the bus to the airport? hi, I will be in barajas airport at 23:30. İs there any way to go to Alcala that time?? My group of students is going to from the airport to Universidad Alcala de Henares. What bus stop should they get off at…. Brihuenga or Esc. Politechnical? 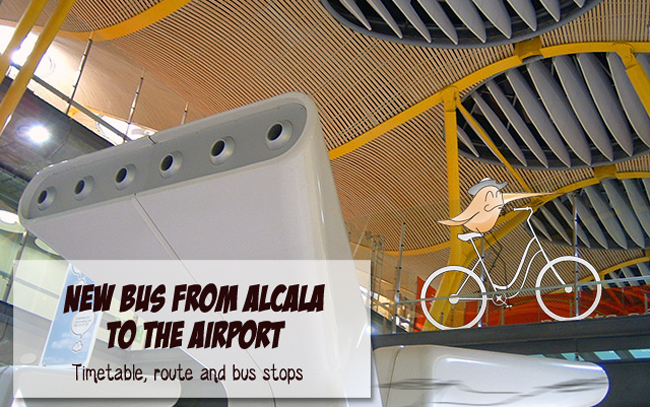 In general, is bus preferred over train from the Airport to Alcala de Henares? The best option is to take the bus because normally it is so much faster than the train. If they are going to Campus Histórico (College of San Ildefonso, the Faculties of Philosophy and Arts, Law, Architecture and Geodesy, Economics and Business, Documentation, Postgraduate School, CRAI, Alcalingua, Benjamin Franklin Institute or Foreign Languages Center) they should get off at Brihuega stop. On the contrary, if they are going to Campus Científico-Tecnológico (Faculties of Biology, Chemistry, Environmental Sciences, Pharmacy, Medicine, Nursing and Physiotherapy, School of Computer Engineering, Polytechnic School, University Residential City, Giner de los Ríos University Residence or Botanical Garden) they should get off at Escuela Politecnica. 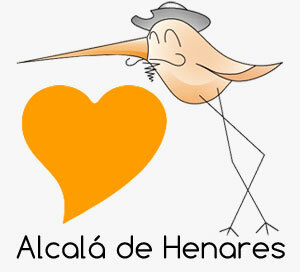 I have to travel from Alcala de Henares to Madrid airport as early as possible on Sunday morning. At what time does the first bus leave from Alcala? Hi, you can see the timetable in this post. The first bus leaves from Alcala is at 7.30 on Sunday. ¿Se transportan bicicletas en el 824? En los autobuses interurbano 824 se pueden llevar bicicletas, tanto las plegables como las no plegables, siempre que vayan empaquetadas en la bodega, y siempre a discreción del conductor. El chófer del autobus 824 del 25 de abril, entre las 4 y las 5 de la tarde, no aceptó mi bici. Y los taxistas me informaron que no les es permitido plegar las sillas traseras de sus coches, así que tuve que tratar de llegar a Alcalá de Henares ciclando – un verdadero horror, como casi no hay carreteras a excepción de autopistas. La verdad vergonzosa: En su sistema de transporte público los ciclistas no existen. Sentimos mucho lo sucedido pero no podemos ayudarte. Te aconsejo que contactes con la empresa de Autobuses Monbus y que les expliques lo que ocurrió. December 2016: I need to get from the Madrid Barajas airport to the Franklin Institute in Alcala in January 2017. I have just been told by administrator at Franklin that there is no direct bus to Alcala. Which is true? If there is a direct bus, can you tell me the closest stop to get off? Is it possible to pick up a cab from the Brihuega bus stop to the Franklin Institute or would it be better it get off at a different stop to catch a cab? Yes, it is possible. When you arrive at Brihuega street you can pick up a taxi (there are many taxis on that street). But we encourage you to get off at the previous stop and you take a walk to the Franklin Institute. Is this bus service still running hoy en dia? Hola ! At which bus stop should I get off, to go from airport to Hostal Bari, Via Complutense 112 ? Thank you. I will be coming from Madrid Airport to Hotel El Bedel in Arkala. What is the bus number & what is the closest bus stop to the hotel? Hi. We need to be at Madrid airport on Monday 7/8 at 8:30. Does this bus still run please? Somos un grupo de 15 personas (13 estudiantes universitarios y 2 profesores)que va a Alcalá de Henares en diciembre de este año (2017). ¿Todavía existe este servicio de autobús del aeropuerto de Madrid a Alcalá de Henares? Is the bus still running tomorrow? Due to all the strikes and things?